After our diversion into the inns and taverns of London, we find ourselves back in the grand continental courts to meet a last of noble birth. Married to the man who would one day be Tsar Paul I of Russia Grand Duchess Natalia Alexeievna lived a short but somewhat sparkly life. She made an impact on courtiers and public alike but her time in the spotlight was all too brief. Born Princess Wilhelmina Louisa of Hesse-Darmstadt to Louis IX, Landgrave of Hesse-Darmstadt and Caroline of Zweibrücken, Countess Palatine, there was never any question that she would be anything but a powerful political bride for some lucky noble. She was one of three unmarried daughters of the Landgrave and when news reached Louis and Caroline that Empress Catherine II was casting her net wide in the search for a bride for her son, Grand Duke Paul, the 18 year old Wilhelmina was certainly on the shortlist. When news reached Prenzlau that the Empress would like to meet the three girls, they were put through a crash course in courtly behaviour and made into the image of perfect royal brides before they were dispatched for Russia on a ship captained by the Grand Duke's best friend, Count Andrei Razumovsky, of whom we shall hear more later. Less than 48 hours after the young ladies arrived in St Petersburg, Paul made his choice: he wished to marry Wilhelmina. An enormous wedding ceremony was held on 29th September 1773 and Wilhelmina, now named Natalia Alexeievna, became a Grand Duchess. The bubbly young woman lit up the Russian court and found favour with Catherine yet this honeymoon period was not to last. It began to be apparent that the new bride was far from an innocent abroad but was, in fact, highly ambitious on behalf of her husband and when he did not share her love for scheming and intrigue, she sought her thrills elsewhere. Soon gossip began to spread that Natalia was involved in a passionate affair with Razumovsky and she became the talk of the court though Paul remained blissfully unaware of the talk about his wife and best friend. In a somewhat bittersweet show of devotion, when efforts were made to exile Razumovsky, it was the blissfully unaware Paul who stepped in to ensure his friend could remain at court! 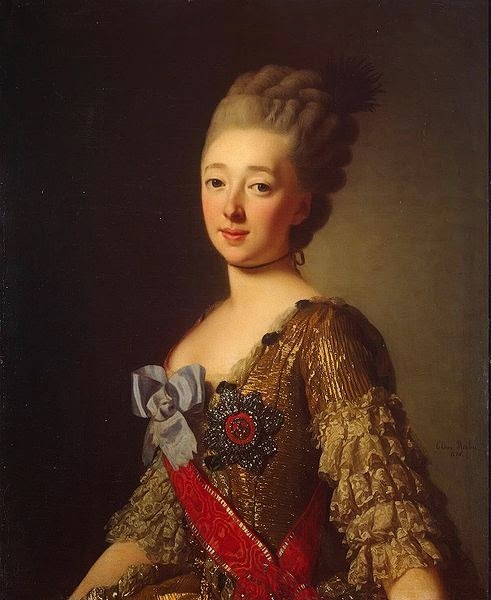 When news emerged of Natalia's pregnancy, more than a few eyebrows were raised on the matter of paternity but as far as the Empress was concerned, if the baby were a boy, then she would consider the child as the rightful heir to the throne. Natalia's long and agonising labour resulted in the birth of a stillborn son on 15th April 1776; her doctors hesitated to perform a Caesarian and neither mother nor child stood a chance of survival. At the loss of his wife, Paul was distraught and for a short time refused to release her body for burial; five months later, he had married again. What a heartbreaking story, Catherine. Sadly, not a happy ending.